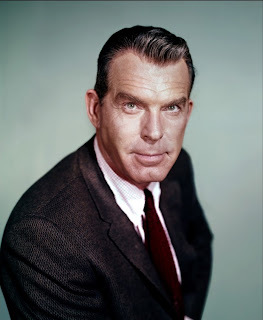 This week’s Uftring Auto Group Classic Celebrity of the Week is Fred MacMurray, uber star of stage and screen. MacMurray was best known as Steve Douglas on the television program My Three Sons, which aired from 1960 to 1972. However, long before he became a television icon, MacMurray acted with some of tinseltown’s biggest stars, including Katharine Hepburn, Humphrey Bogart, Jack Lemmon and many more. The classic film noir Double Indemnity (1944) is MacMurray’s best known film role and in the mid-1940’s he was the highest paid actor in Hollywood and the 4th highest paid American. If that isn’t solid enough, MacMurry was the initial model for the superhero Captain Marvel. The great Fred MacMurry retired from acting in 1978 – but will forever live on in reruns and classic movie rentals. If you are smart and stay home on New Year’s Eve . . . head out to the local video store and grab Double Indemnity or The Apartment and enjoy some of Fred MacMurray’s finest work.